A great Beatles fact for "She's a Woman" is that it was written and recorded on the same day at Abbey Road Studious: October 8, 1964. Released as the B side to "I Feel Fine," the song was released in the UK and and U.S. on November 27, 1964 and November 23, 1964 respectively. 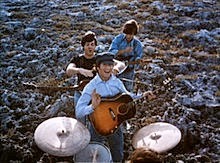 The song was a part of the Beatles' touring repertoire from 1964 to 1966. Part of the song is heard during Help! when the group is on Salisbury Plains. McCartney handles bass, piano, and vocal. (Note how prominent the bass is on this track, and also how much the piano helps keep a background melody sustained.) Harrison plays lead, Starr plays drums, and Lennon plays rhythm, with the distinctive opening downstroke on his Rickenbacker 325 sustained throughout the entire song.